TJ Maxx is a discount department store with more than 1,000 locations throughout the United States. Founded in 1976, TJ Maxx stores offer discounted name-brand apparel, shoes, and accessories for men, women, and children. Limited supply of these designer deals helps the retailer to sell its inventory quickly. Its revenue rivals big-name department stores such as Macys and Nordstrom. TJ Maxx is considered to be a higher-end store when compared with direct competitors, such as Marshalls and Ross. In search of a great deal, these popular stores attract a high volume of customers every day. Its parent company, TJX Companies, operates a suite of well-known retail stores in the United States and around the world, including Marshalls, Winners, HomeSense, and HomeGoods. While we spend time browsing the aisles in our favorite store, we don’t consider the hazards that may exist while we shop. With our attention focused on that rack of clothes that has a great price, we can get injured when stores don’t take reasonable steps to ensure safety as we shop. If you have been seriously injured while shopping at TJ Maxx, contact the Wolfson Law Firm for a free and confidential consultation. Slips and falls – Liquid on flooring can cause slippery surfaces. Rain water can pool up around entryways or be tracked throughout the store. Bottles that contain liquids, such as perfumes and makeup, may fall and break on the floor. If these hazards are not cleaned up, customers can slip and fall. Floors that are newly mopped or waxed can create slipping hazards if a store doesn’t place warning signs around the area. Slips and falls may also happen when objects are left lying on the floor. Clear hangers or clothing laying in the aisles or between racks can cause a customer to slip and fall if they don’t see it. Obstacles in walkways – Stock carts are often placed in the middle of walkways. Boxes or other objects that stick out near the bottom of the cart can cause tripping hazards. Unstable carts can tip over if they have too much merchandise. With most carts having wheels on the bottom, unsupervised carts can attract kids to ride or push them around, potentially tipping the cart over or hitting other customers. Display cases or racks that stick out in the aisles can result in cuts or scrapes if a customer inadvertently runs into them. Falling objects – Stores may display merchandise high on their walls. Shelves that have too much weight on them or are put up incorrectly can fall. Customers reaching for merchandise can accidently knock other products or displays down. Overhead or hanging displays may fall if not secured properly. Customers that are shopping below can be hit in the head or face if falls occur. If the objects are heavy or sharp, this can cause serious injury. Store racks, shelves, or display cases sitting on the floor can fall over if they have too much merchandise on them or are not put together properly. Shelves and display cases may also fall if they aren’t secured to a wall or have a stable base. The weight of the display case or shelf as it falls may result in a severe injury to the head or neck. Young children could be crushed. If you have been injured in a retail store accident, seek medical attention immediately if your injuries are severe. 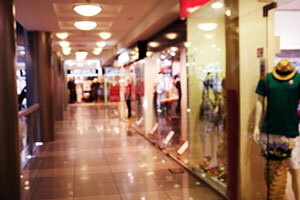 The Wolfson Law Firm has represented victims who have been injured in retail store accidents since 1963. Victims are often stuck with high medical bills and may have lost income due to an inability to work. It is essential that you receive compensation to help pay for medical services and lost wages while you recover. Engaging a personal injury attorney can help you to recover the compensation you need to pay your bills. They can represent your interests to insurance companies and legal teams. If you have been seriously injured in a retail store accident, contact our personal injury attorneys for a free review of your case at 305-285-1115.